Huggable and shaggy under a number of fluffy white layers, Big Polar Bear and Little Polar Bear (Eilidh MacAskill and Fiona Manson) are most definitely ursine creatures. They snooze, scratch, stretch, sniff and roar (in a very friendly fashion) in a gentle introductory dance routine to Greg Sinclair's sweet, tinkly electronic score, designed to put any bear-scared tots amongst the audience at ease. From here, the cleverly-designed set unfolds to help us explore the concept of 'up', with puppetry, clowning and eye-catching sparkly special effects. The plot is concerned with rescuing a fly-away balloon from space, a quest that will be compelling to any child who's ever accidentally let go of a string, but it's the wonderful, wordless physical comedy that really carries us. 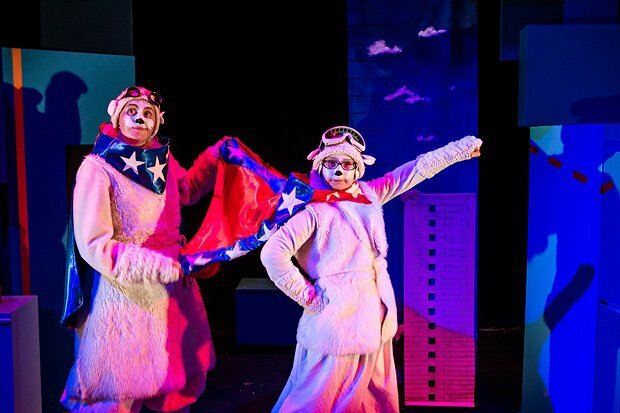 MacAskill and Manson have that easy chemistry of experienced performers who genuinely enjoy each other's company, and the biggest belly laugh of the show occurs when Big Polar Bear gets a cardboard box stuck on her bottom. That said, it's a treat to see high, intelligent production values aimed at younger audiences. Pleasance @ EICC, until 27 Aug (not 21), 11am, £8.